Download "Their stories are tragic. A new chapter starts now. now." 2 ! Their stories are tragic. A new chapter starts now. now.! Bully is a movie that tells powerful stories about children and their families dealing with extreme pain and tragic consequences related to bullying. These are sad stories that remind us of the tremendous responsibility we have to stop hurtful behaviors, create supportive communities, and strengthen the emotional health of our children and teenagers. 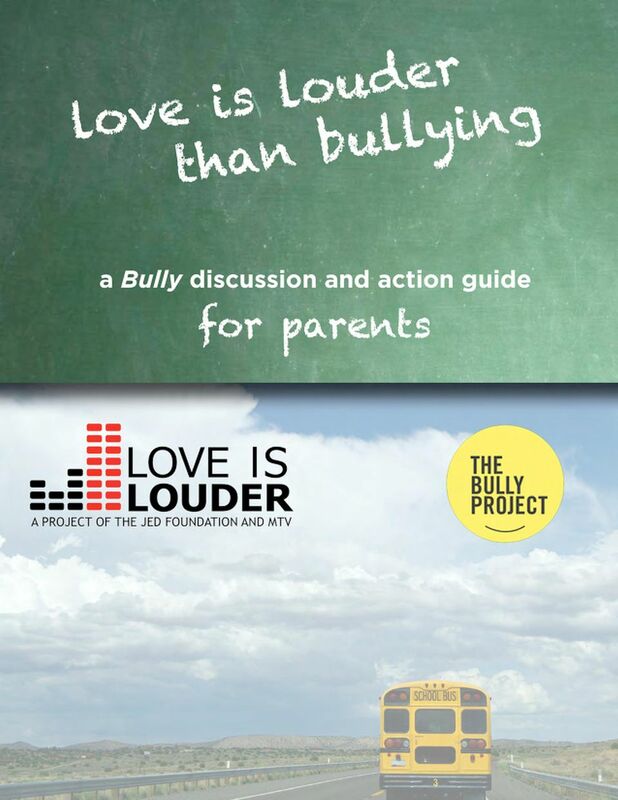 Love is Louder than bullying means that the right types of caring, connection, support and action, can stop and overpower the negative influences and voices that make our children feel disconnected, different or hopeless. This guide turns awareness into action by providing talking points for a discussion with your child and ideas for things you can do as a parent. 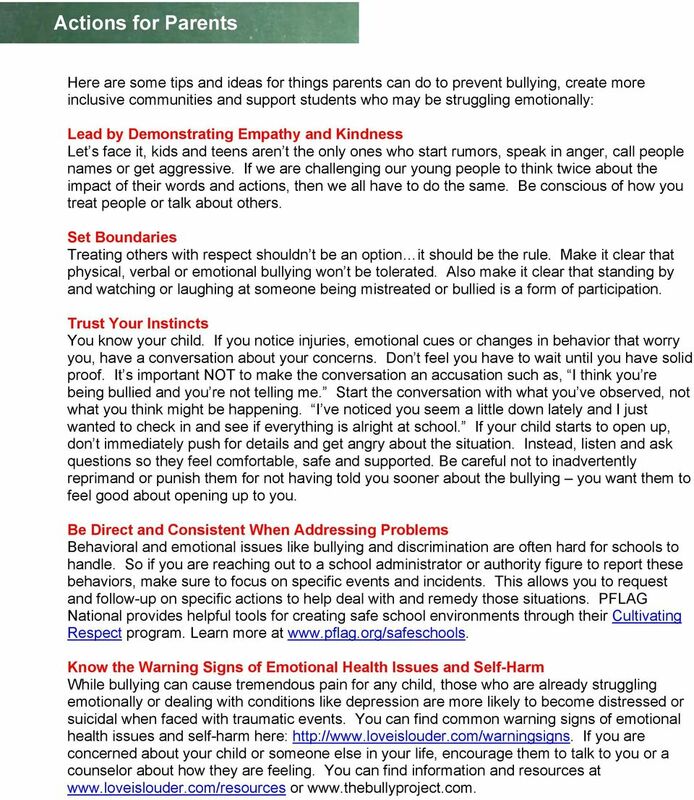 Here are some things to keep in mind as you take action to stop bullying and work to build more supportive school and community environments: Bullying means many things. Bullying is most often defined as aggressive, and often repeated, behaviors intended to cause harm. They can be verbal, physical or emotional. Many of the examples given in the movie Bully are extreme cases in which students are being physically injured, publicly humiliated or seriously threatened. It s important to realize that there are also more subtle forms of mistreatment that can still cause serious damage. Students being talked about behind their backs, looked down upon, left out, or made to feel not good enough, smart enough or attractive enough, can all be just as painful as a shove or a sharp insult. So, when we talk about bullying, we must think about a range of hurtful behaviors, as well as the way that makes kids feel, and their ability to deal with those Bullying can impact or involve anyone. Anytime we look at solving a social issue like bullying and mistreatment, it s important to identify groups who might be particularly at risk for distress. So any group of students that feels different or disconnected might be more likely to be mistreated, or feel alone and hopeless. This could include people from certain cultures or religions outside the local mainstream, young people who are LGBTQ or struggling with their sexuality, or students with learning disabilities or special needs. If your child fits into one of these categories, it s important to learn more about the challenges they face and look out for signs that they are having a hard time. But being mistreated or feeling hopeless can happen to any student. So just because your child doesn t fit into a certain mold doesn t mean they are immune. Likewise, any child is capable or using their actions or words in a way that hurts other. There is no single type of bully, and the bystanders who watch, laugh or spread gossip about what happened, are also contributing to the problem. It s about the behaviors!and the feelings. Every individual has a different emotional make-up and a unique set of strengths and weaknesses. We all have different ways that we cope with bad things that happen to us. That s why some young people are able to weather traumatic events like bullying, and others may shut down or have thoughts of self-harm. So, while we focus on stopping the hurtful behaviors, we must also look for warning signs of other emotional problems like depression, lack of coping skills and self-image issues that may require attention in addition to the bullying. 3 Discussion Guide I In having a dialogue with your child about Bully, it s important to focus on both the problem and the solution. In the film, parents and administrators are shown trying to help, but aren t always able to make things better. It can be frustrating for young people when they can t see hope or an opportunity to make change. 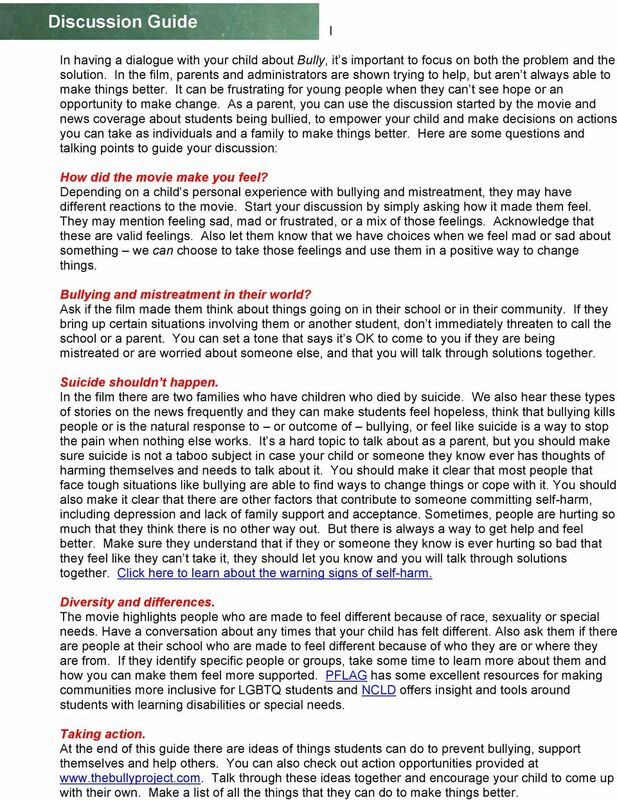 As a parent, you can use the discussion started by the movie and news coverage about students being bullied, to empower your child and make decisions on actions you can take as individuals and a family to make things better. Here are some questions and talking points to guide your discussion: How did the movie make you feel? Depending on a child s personal experience with bullying and mistreatment, they may have different reactions to the movie. Start your discussion by simply asking how it made them feel. They may mention feeling sad, mad or frustrated, or a mix of those feelings. Acknowledge that these are valid feelings. Also let them know that we have choices when we feel mad or sad about something we can choose to take those feelings and use them in a positive way to change things. Bullying and mistreatment in their world? Ask if the film made them think about things going on in their school or in their community. If they bring up certain situations involving them or another student, don t immediately threaten to call the school or a parent. You can set a tone that says it s OK to come to you if they are being mistreated or are worried about someone else, and that you will talk through solutions together. Suicide shouldn t happen. In the film there are two families who have children who died by suicide. We also hear these types of stories on the news frequently and they can make students feel hopeless, think that bullying kills people or is the natural response to or outcome of bullying, or feel like suicide is a way to stop the pain when nothing else works. It s a hard topic to talk about as a parent, but you should make sure suicide is not a taboo subject in case your child or someone they know ever has thoughts of harming themselves and needs to talk about it. You should make it clear that most people that face tough situations like bullying are able to find ways to change things or cope with it. You should also make it clear that there are other factors that contribute to someone committing self-harm, including depression and lack of family support and acceptance. Sometimes, people are hurting so much that they think there is no other way out. But there is always a way to get help and feel better. Make sure they understand that if they or someone they know is ever hurting so bad that they feel like they can t take it, they should let you know and you will talk through solutions together. Click here to learn about the warning signs of self-harm. Diversity and differences. The movie highlights people who are made to feel different because of race, sexuality or special needs. Have a conversation about any times that your child has felt different. Also ask them if there are people at their school who are made to feel different because of who they are or where they are from. If they identify specific people or groups, take some time to learn more about them and how you can make them feel more supported. PFLAG has some excellent resources for making communities more inclusive for LGBTQ students and NCLD offers insight and tools around students with learning disabilities or special needs. Taking action. 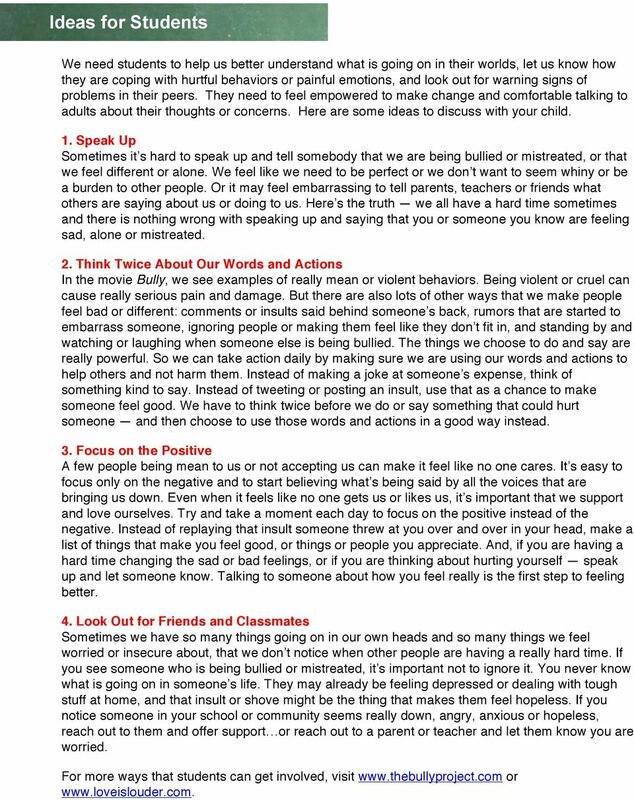 At the end of this guide there are ideas of things students can do to prevent bullying, support themselves and help others. You can also check out action opportunities provided at Talk through these ideas together and encourage your child to come up with their own. Make a list of all the things that they can do to make things better. ADULT ABUSE. We need your help to make it stop See it Hear it Report it! WHAT IS BULLYING? For Parents and Families: What to do if a Child is Being Bullied Bullying among children is aggressive behavior that is intentional and that involves an imbalance of power or strength. Cyber-Bullying - Using technology to repeatedly and on purpose say or do mean or hurtful things to another person who has a hard time defending himself or herself. (Adapted from Olweus, Dan and Susan P.
A Guide for Parents of Elementary and Secondary School Students The effects of bullying go beyond the school yard. As a parent, here s what to watch for, what you can do, and where you can go to get help. Italy, Spain, Netherlands, New Zealand, Greece,,, & GERMANY: Which ONE, if any, of the following BEST describes the type of educational establishment you will be attending for the next academic year (i.e. Working to standard: a code of conduct for support workers in health care. 1.1 Welcome to this code of conduct for support workers in health care. Speaker notes from Indigo Daya at the Borderline Personality Disorder What Works Conference, 2014. 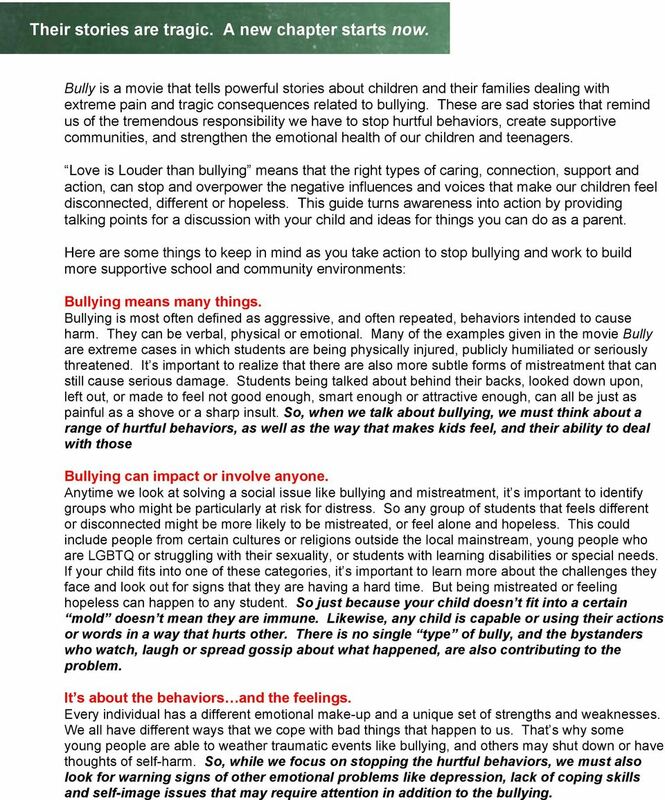 STOP BULLYING Taken from Kidscape Preventing Bullying document. Physical: pushing, kicking, hitting, pinching and any other forms of violence. A Parents Guide to 2014 ConnectSafely.org Parenting in the age of social media can be tricky. Australians are amongst the highest users of social media in the world, averaging 22 hours per week per person. Chapter 3 Online Bullying Children and teens often face online cruelty (as well as cruelty in the real world). For younger kids, instant messaging and texting can become platforms for teasing and meanness. When students do not meet your behavioral expectations but are not exactly breaking the rules and may not deserve an official consequence. Topline Report. Prepared for: June 9, 2011. 2011 Knowledge Networks, Inc.